LIE to Exit 59 (Ocean Avenue) and head south on Ocean Avenue (make a right if coming from West, a left if coming from East). Make a right onto Veterans Highway, and get into left lane. Turn right onto 7th Street, and continue to end. Sunrise Highway to exit 47A. If coming from WEST, make a LEFT onto Oakdale Bohemia Road. If coming from EAST, make a RIGHT onto Oakdale Bohemia Road. Take to end and make a left onto Sycamore Avenue. Go approximately 1.8 miles and make a left onto 7th Street, and continue to end. Make left onto Motor Parkway and proceed 4/10 mile to Parkway Blvd. Make Right onto Parkway Blvd. Three blocks, make left onto Cherokee Street. School is at end of street. LIE to Exit 59 (Ocean Ave). Cross over railroad tracks, and 1/4 mile after tracks make right at light onto Peconic Street. 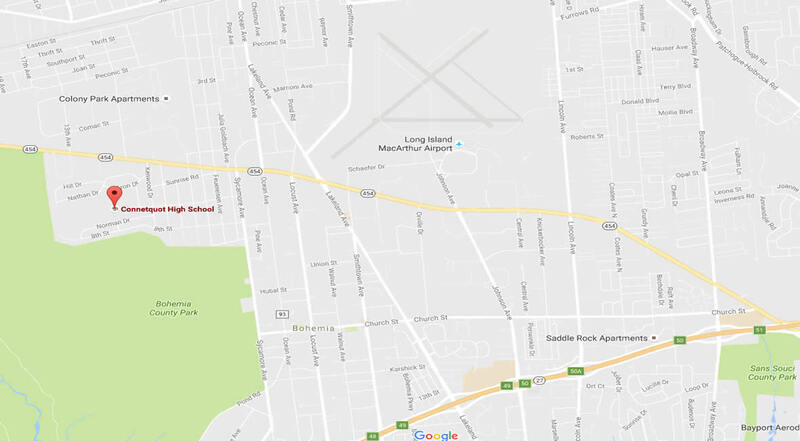 Travel approximately 1/2 mile to Ronkonkoma Middle School, on right. LIE to Exit 59 (Ocean Avenue).